"SO WE MEET AGAIN" Grandma gave her the mythological name of wedlock goddess - Arundhati, the pure ray of light, sitting in the sky as the Morning Star. And she turned out to be a miraculous baby to survive unscratched as the racing family car plunged into a fifty feet deep ravine. Nature was bent to bequeath her with every charm and delicacy of alluring art to adorn her adolescence. Destiny pushes her to be a TV Star. And she turns out to be a perfect goddess to win and rule the millions of hearts through her enigmatic personality and the mesmerizing looks. In an eve teasing effort, a Captain of the Indian Army looses heart to her hurt looks. But the mystic Gurus, Pundits and her Russian fortune teller friend Olga proclaim that her soulmate would come from oceans across foreign land. Her premonitions are intense and she hears him calling her. Arundhati echoes back through the snow crested Himalayas, lush forests and planes, and then her spirituality pulls him into the ripples of holy Ganges. He is her love of eras and time that spans over centuries and many re-incarnations - a Pakistan origin British citizen Navid. Destiny had made him cast only one look at her and he is so captivated as to follow the 'Ray of Light' to India. He could give his life for the aroma of her call. In Tel Aviv, Aliza, an adorable Israeli commando and replica of Arundhati holds a bouquet for Captain Kishan; and in London an Iranian business tycoon Mustafa holds a signet ring for Olga. But, Arundhati had to go past the hatred between two archrivals, two 'great' enemies - India and Pakistan; and then, the Hindu-Muslim religious discords. The Devil and his demons are on the look out for Adam and Eve. And what is the Divine Decree...? 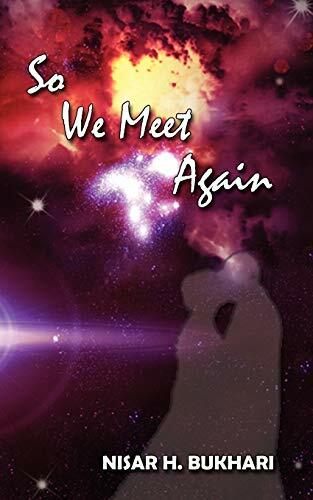 "So We Meet Again" has the answer.